The Centers for Medicare & Medicaid Services (CMS) imposes strict standards on all Medicare Advantage (MA) organizations that contract with Medicare for the provision of medical care services to beneficiaries enrolled in Medicare Advantage plans. Among the considerable range of requirements that these participating Medicare Advantage organizations (sponsors) have been required to comply with are the requirements to implement and maintain effective corporate compliance programs, which contain seven core measures to prevent, detect, and correct non-compliance with CMS’s program requirements, as well as fraud, waste, and abuse, in accordance with 42 CFR § 422.503(b)(4)(vi). Presumably, the objective of these measures is to ensure the integrity of the Medicare Advantage Program and protect Medicare beneficiaries and program funds. 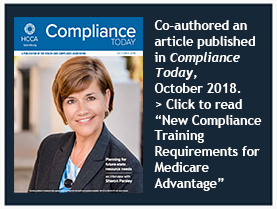 Although Medicare Part D plan sponsors are also required to implement and maintain compliance programs, this article focuses on providers that contract with Medicare Advantage Organizations only. Reproduced with permission. Copyright © 2018 Compliance Today, a publication of the Health Care Compliance Association (HCCA).